Go to any forum on shale gas drilling and you'll hear it. NY Governor Andrew Cuomo's said it. Pro-drilling advocates say it. Pro-health & environment advocates say it. "Show me the science about drilling!" Now, thanks to a couple of databases, you can do just that. Physicians Scientists & Engineers for Healthy Energy have compiled a database of peer-reviewed articles on Shale Gas and Tight Oil Development. Their database provides abstracts, bibliographic information, and links to articles, and it's organized by category. Looking for information on air quality? Go to that file. Other categories include water quality, climate, economics, regulation, public health, seismicity... if you're looking for it, they probably have it. 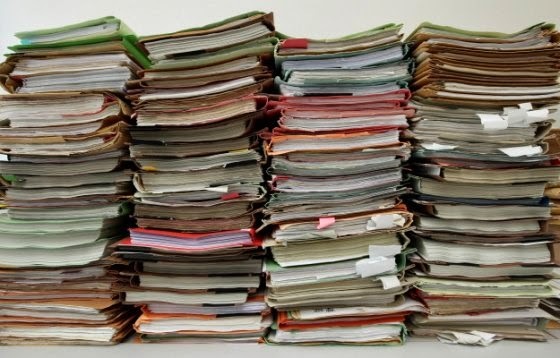 Bucknell University has a database as well - print-based publications that focus on the scientific, technical, sociological and economic aspects of shale gas and hydrofracking. It's called the Marcellus Shale Initiative Publications Database, and includes articles from industry journals and conference proceedings. Of the 846 articles, only 185 are peer-reviewed. If you know of more online database libraries, please let me know and I'll add them to this list. Thanks to Ellen Harrison and the folks at Fleased for sharing information about these databases. Does a Lease give Gas Company the Right to Keep Friends off your Property? When a gas company leases land, exactly what do they "own"? It's understood that they've got the right to extract gas from under the surface - and if they've leased surface rights, they can build access roads and other structures. But does a lease give the company the right to dictate who comes on the surface - even for properties where the company has no active drilling operation? What about properties for which the company only has subsurface rights? Cabot Oil & Gas Corporation thinks so - and they have gone to great lengths to keep an individual from stepping foot on property they don't even own. Last fall a judge ruled in Cabot's favor, giving them an injunction that bars local resident and citizen-journalist Vera Scroggins from Cabot-owned properties. That injunction also bars her from any property in the county where Cabot only has a lease to extract gas from under the surface, with no surface rights. Those properties include: the grocery store where Scroggins does most of her shopping, her bank, the recycling center, the hospital, and many friends. What sort of dastardly act has Scroggins committed to deserve such a ruling? The retired nurse aid and grandmother happens to be one of the more vocal opponents to gas drilling in her town. For the past few years she has acted as a citizen-journalist, documenting the activities of gas companies operating in the area, and giving tours to visitors to show them what industrialized gas drilling looks like. She has testified before state regulatory officials, and asked questions of gas company employees - too many questions, apparently. Her "crime": attempting to hold the gas drillers accountable for their activity. In response, Cabot hit her with a lawsuit and then obtained this outlandish injunction that bars her from driving on local roads, spending money in local shops, or taking a casserole to a sick friend. To say that this injunction is "overbroad" is an understatement. It violates her constitutional rights and the rights of any other individual - including journalists - who might stop on a public road to take a photo of gaswell activity. This ridiculous injunction should also give landowners pause: just what rights are they losing when they sign a gas lease? 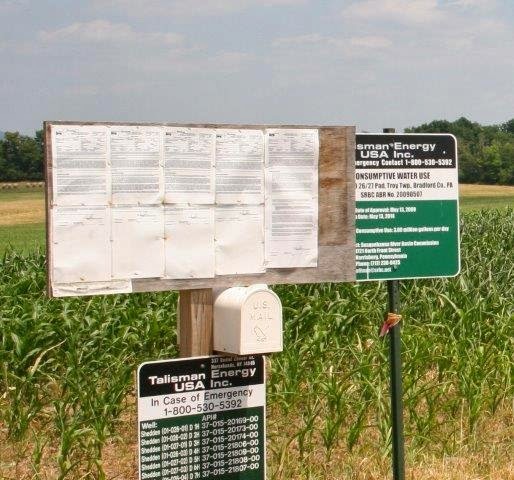 Even if they only allow subsurface rights (gas company has no rights to any surface activity) are landowners signing away their freedom to invite who they want onto their land? And in a state like NY, where compulsory integration allows landowners to be forced into drilling units against their wishes, does that mean gas companies can dictate who they can invite to hunt on their property? A hearing to vacate the injunction is scheduled for Monday, March 24 in Montrose, PA. Fortunately, public interest attorneys are going to bat for Scroggins, and you can read their "Brief in Support of Motion to Vacate Preliminary Injunction" here. Paula Fitzsimmons, a Physician Assistant and signatory to the letter, says the Schuyler County medical community needs to have more public conversation about the potential health impacts of a storage facility. There’s been public discussion about environmental and economic issues, she says, but health issues have been overlooked in the permit review process. So on Tuesday, March 11, Fitzsimmons will join geologists and public officials for a public forum to address the proposed expansion of gas storage in the salt caverns. The forum, “Seneca in the Balance”, begins at 7 pm (doors open at 6) in the Watkins Glen High School Auditorium, 301 12th Street. Fitzsimmons hopes this forum will spark dialog between health professionals – but one agency that seems to be missing from this very important conversation is the Schuyler County Public Health Department. In a conversation a couple weeks ago, Fitzsimmons listed three major concerns. First there’s the watershed. While storing gas isn’t the same thing as fracking a well, an accident could have the same health impacts. An accident releasing chemicals into the lake would contaminate the water supply of 100,000 residents. Second is air quality. The goal of Inergy (now Crestwood Midstream) is to store gas from other areas, so the facility will become an industrialized hub of storage and transportation activity. The result will be more emissions and particulates generated by increased traffic, compressors and flare stacks. Fitzsimmons is concerned about rising asthma rates and increased risks to fetal health. “We can expect the quality of life to go down for anyone with lung disease,” she says, noting that the environmental impact studies failed to take into account cumulative air impacts from vehicles and equipment. There are other health issues as well, including noise pollution, light pollution, stress related to becoming an industrialized area, and an increased accident rate due to more traffic on the rural roads. Third is whether the county is able to respond to a large scale catastrophic incident. “This project would allow dangerous and volatile products to be stored under pressure in a cavern with known integrity problems,” says Fitzsimmons. If there were such an incident, it’s the local volunteer agencies that would respond – and they are undertrained and unprepared to respond to such an emergency, she adds. There’s cause for concern. In 2001 a gas leak from a salt cavern storage facility in Kansas migrated seven miles before exploding in the town of Hutchinson. Two people died, many lost their homes, and firemen battled the flame for days. More recently, the collapse of a wall in a salt cavern just 75 miles north of New Orleans, Louisiana, has caused a massive 26-acre sinkhole. Hundreds of people have evacuated and now there is a threat of gas migrating into the ground beneath their homes. 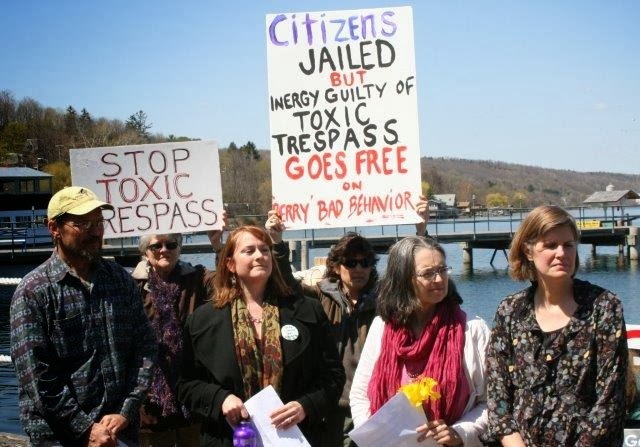 Given the proximity of Watkins Glen to the proposed gas storage site on Seneca Lake, Fitzsimmons and her colleagues have reason for concern. A new study finds that methane leaks from the production and transportation of gas could be 50 percent higher than EPA estimates. It also warns that switching vehicles from traditional gasoline and diesel to natural gas will do nothing to slow climate change. “Methane Leaks from North American Natural Gas Systems” is a policy paper - a collaborative effort by sixteen academics who reviewed and synthesized data from 200 papers published in the past two decades. The lead author is Adam Brandt, an assistant professor of energy resources engineering at Stanford University. In comments to the press, he explained that official agencies such as the EPA are underestimating leakage of natural gas into the atmosphere. Brandt reminded people that leaked methane is a greenhouse gas, just like carbon dioxide, but 30 times more potent. He also noted that although converting fleets from diesel to natural gas sounds like a good idea – burning gas puts less carbon into the atmosphere than burning diesel – any potential climate benefits would be negated by the leaked emissions from gas drilling and production. Tony Ingraffea agrees that there is more methane escaping into the atmosphere than is accounted for by EPA studies. But he criticizes Brandt et al for not going far enough in their review. 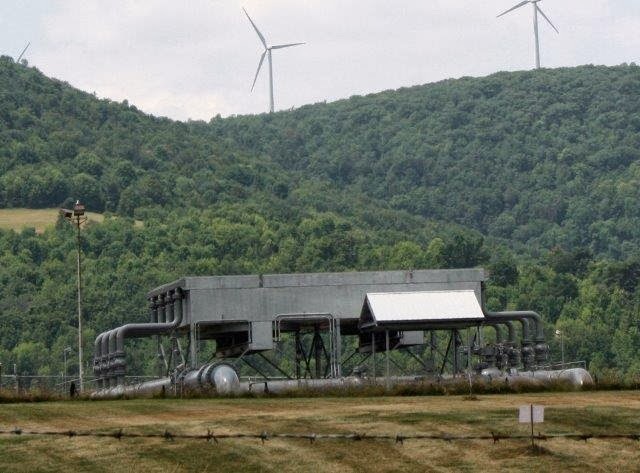 Ingraffea, a professor at Cornell’s School of Civil and Environmental Engineering, co-authored an earlier study warning that extracting natural gas could do more to aggravate global warming than mining coal. The problem with Brandt’s study, says Ingraffea, is that it ignores some important data. In particular, the authors eliminated data that seemed “too high” – even though they were actual measurements. Several recent studies have used airplanes and towers to measure methane in the air and found emissions to be much higher than EPA estimates, with some as much as 75 percent higher. Brandt and his colleagues determined that those measurements were too high, or came from production areas that weren’t representative of the country as a whole, so they dismissed the data. But you don’t get to toss out data you don’t like unless you have very good reason, says Ingraffea. Ingraffea also takes issue with the study’s claim that, if industry could plug up the leaks, burning gas in power plants would be better for the climate instead of burning coal. In order to make that claim they stretch out their timeframe to 100 years. Now is a good time to be reexamining and summarizing previous studies, says Ingraffea. But it’s premature to draw conclusions, because every year there are new studies by scientists collecting actual measurements in the air and on the ground. And the data from these new studies continue to show methane emissions at rates much higher than previously thought. Looking at the big picture, Ingraffea believes the study asks the wrong question. Instead of trying to pin down an average emission rate of methane, they should be asking how much risk we are willing to take. “Risk is the key issue of any policy decision,” says Ingraffea. Sometimes there are bad things that can happen, but they have little consequence so we live with them – even if they happen frequently. “But this is one thing with a major consequence, so we have to be conservative in our risk taking,” says Ingraffea. Using the average value of methane emissions is inadequate, he says. Policy makers need to peg emission allowances closer to the lower end – and even then acknowledge the uncertainties surrounding that level. This article first published in Tompkins Weekly, February 24, 2014.